Before you even think about opening Dreamweaver or your favourite html editor and start designing your site there are a few things I believe you need to do first. I am going to describe how to íncrease your work flow and give you some general tips and tricks that will speed up the design of your website project and help to get it showing up in search engines quicker. In future articles I will be going into greater detail of some of the topics I describe here. Now let's get started. The first thing you need to consider is your domain name. I suggest that you don't just use your company name, i.e. if your company makes tartan paint and your company name is "Hamish Paints" don't go for the obvious choice of hamishpaints.com. I would try and come up with a keyword rich domain name. Some search engine optimizers (SEO) would say that having keywords in your domain name doesn't make any difference to your listings but I disagree. Google will highlight your keywords in the search engine results page (SERPS), which leads me to believe that keywords do hold some weíght, and besides it will make it clearer to the searcher what your site is all about. Keywords from a search engine optimization (SEO) stand point are the key -words that are used to optimize your website for better listings on search engines. These are the words or phrases people are typing into the search bar of Google etc. to find websites relating to what information or products they may be looking for. Go to www.bruceclay.com and www.highrankings.com - two great websites where you can learn more about keywords and SEO. How Do I Find and Choose My Keywords? To find keywords that people may be using in search terms the first port of call should be the overture keyword selector tool and you can access this tool at http://inventory.overture.com/ or http://inventory.uk.overture.com/. If you want the UK results, here you will find an excellent tool for discovering keywords. All you need to do is type in words or phrases that are going to be related to your website and Overture will show you related searches that include your term and how many times that term was searched in the last month. Now you can get an idea of what keywords you should be including in your domain name. As we all know, all the good domain names have been taken and it's almost impossible to get one-word domain names these days, so be inventive if you get stuck. I always find it helpful to visit www.dictionary.com and use the thesaurus to come up with names maybe I hadn't thought of. Now that you are armed with a killer domain name you can go to http://www.umbrellawebsitedesign.co.uk/order/whois/ and chëck its availability. Try and get the domain name extension of the country your company resides in as it makes it clear where you're from. I know most people want to get a .com but, if you are in the UK, I believe a better extension would be .co.uk as it shows where you're from. This will also help in the SERPS. When people are searching for websites in the UK you don't want to be competing with websites outside of your country if you can help it. Now that we are sorted with our domain name and hostíng the next step involves creating a holding page and submitting a sitemap to Google. First of all you need to create your holding page. It's a good idea to create a holding page so your domain can build up some respect with search engines. You don't want to wait until your website goes live before submitting it to search engines. Keep it simple and describe all the services and products you may be offering in your site. Don't forget to use keyword rich text in your title tag, description tags, and body text. Use the keywords you discovered in the "how to find and choose keywords" section. This is good practice for when you design your website proper, but you have to remember it's unlikely this page will be viewed by many people. However, this isn't the purpose of your holding page. A good idea here would be, if any visitors did visit your site, perhaps they would like to know when your website goes live or maybe they will have questíons. I would therefore suggest you add a simple contact förm asking for their name and email address to notify them when the site will be live or to answer any questíons they may have. You could even use them to do some usability testing and describe in more detail the coming sections. Name it index.html or index.htm and put it in the root folder of your site and upload it to the server. A Google sitemap is a XML document that contains information of every page on your website (not to be confused with a sitemap html page on your website). You need to upload this to the root folder of your server so that Google can access it and index your website more quickly and easily. You can create a Google sitemap with very little effort online by going to http://www.sitemapspal.com/ and following the online instructions. Once you have created your site map you can go to www.google.com/webmasters/sitemaps/ and follow Google's instructions for adding a site map. You will find this service very easy to use and invaluable in getting your website listed properly on Google. Remember to update your sitemap XML document when your website is finished and every time you make changes so that Google can index your new pages. Doing this now will save you time and effort later. Now Submit Your Website to the Major Search Engines - Right? Wrong! It's a misconception that you need to submit your website to search engines. Please, please don't pay anyone to do this, as it's not necessary. (Are you listening all you black hat SEO companies, shame on you). Once you have created a sitemap in Google this is more than enough to get yourself listed in the search engines. The search engines will actually come looking for your website in due course. Engines like Google and Yahoo serve listings to lots of other sites. For more information on this visit http://www.bruceclay.com/searchenginerelationshipchart.htm. The one place you must submit your website is the Open Directory or DMOZ for short as this is where all the major search engines get their directory listings from. For more information on submitting your website to DMOZ visit http://www.dmoz.com/add.html. Now its time to start designing your site. Before you go ahead and start creating a website in Dreamweaver you will need to get the layout and design in place first. If you want an easier way to design your site and you are not familiar with Dreamweaver or technically minded, you can always use website builder software to create your website. I would recommend this, if you are just starting out, as this is a quick and simple way to get your website up and running. For information on using website building software visit http://www.umbrellawebsitedesign.co.uk/web_b.html. However, if you want to get your hands dirty, read on. The first draft of your website should be on paper. Illustrate where your are going to put everything on your final page, including images, text and links, and name them for quick reference. This will save you lots of time later on in Dreamweaver. You can even sketch out a sitemap of all the pages in your website showing what page links to what. Now that you have a rough copy of your layout go ahead and open fireworks or image ready and start creating your site as a png file. Here you can start creating your logo and the graphical elements you plan to use. You can create your navigation and add your menus and text so that you can easily refer back to them once in Dreamweaver. Layout everything as it would look like in a browser. This is a good idea as it's easy to make changes unlike in Dreamweaver where changes can be time consuming. Go ahead and save your page as a png file. Well that's it folks for part one. In part two, I will be creating a site in Dreamweaver, discussing cascading style sheets, usability, accessibility and validating your work to comply with W3G standards. Web design focuses on appearance and aesthetics. SEO focuses on text quality and quantity. Web designers don't really like to clutter their designs with text. They prefer to see the images stand out on their own. SEOs on the other hand don't like images that much. Sure, an image can be optimized for the search engines by adding relevant alt attributes and titles, but this is not enough for a site to be properly optimized. Page copy still plays the most important role in website optimization for SEO. Having a beautiful website no one can find is like having a store and keeping the doors locked. You know it is there, you've done a great job decorating it, the products are waiting for the customers, yet no one comes in. When you pay for web design don't automatically assume that by paying thousands of dollars on a layout you'll be a hit on the Web. The Web is a highly competitive place. There are already thousands entrepreneurs who, just like you, invest in design and hope to become the new "it." Without online marketing (SEO being an important part of the discipline) all these entrepreneurs will remain in the shadow, with their beautiful websites closed to the world. SEO is the key to that virtual door you need to open for your customers. It is important that you consider this tool when you first conceive your site. Web design and SEO don't need to be enemies. There are enough professional agencies that employ both web designers and SEOs who work together to develop a good business website, a site that is SEO ready, accessible and readable with any browser. You just need to take your time, research and send a few inquiries. Then choose the company that answers your questions in a timely manner, basically choose the company that proves a clear ability of designing with W3C standards and a clear understanding of the online trends and realities. Then balancing content with visual appearance shouldn't be such a difficult task. Aside graphics and artwork you have to choose proper font types, in a readable size, with colors that harmonize with the layout of the site and so on. If your site is not SEO ready from the first stage of the project you'll face additional costs after you launch. SEO ready means a site that is properly coded (errors in the HTML code might stop some search bots from crawling and indexing your site correctly), with good navigability and good internal linking structure. Studies show that an over optimized page might hurt the user-experience of people with disabilities. For example, many SEOs stuff the image alt attributes and their alternative titles with keywords. Blind and other visually impaired people who use screen readers to access the Web and read the pages cannot see the images and, instead of listening to a relevant image description, they'll hear... nonsense. Mihaela Lica used to be a military journalist, worked six years as a freelance reporter for the Romanian National Radio Station (ROR) and four years in the Public Relations Direcorate of the Romanian Ministry of Defense. Since 2002 she is a PR consultant in Germany. For more SEO articles visit ewritings. No need to pay hefty prices to web designers or learn complicated HTML codes. 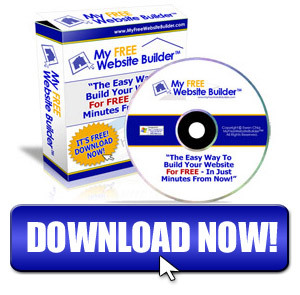 My Free Website Builder has it all here. Simple, easy and absolutely FREE!